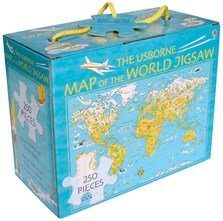 A 250-piece illustrated jigsaw of the world with lots of intricate detail for children to pore over. The jigsaw shows a colourful and informative map covered with pictures and place names. Packaged in a sturdy carry box with cord handle and name tag.